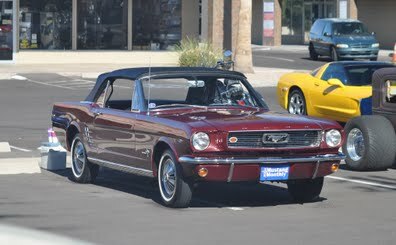 Scott Bouchard's '66 convertible has been in his family since new. Scott Bouchard's mother, Marie, wanted Candy apple Red. At the time, Scott was an impressionable kid who greatly anticipated the arrival of the family's new Mustang. As Scott was hauled from pillar to post in the Mustang, he wondered what it would be like to drive it. In 1973, he got his wish. New driver's license in hand, Scott took his first spin in his father's Mustang. When it came time for Scott's parents to let go of the Mustang, there was debate on which family member should get the Mustang. But there was really only one choice. Scott had the drive and determination to take possession of the car and restore it to its former glory. These days, Scott is focused on getting a grille medallion and entering the MCA's coveted Conservator Class. Scott, a member of Tucson's Old Pueblo Mustang Club, still has the original invoice and Owner card. When Scott restored the convertible 15 years ago, it was a step-by-step process. Paint and bodywork consisted of massaging out the flaws and rust, then laying down PPG two-stage paint in Vintage Burgundy. Once it was in paint, he tackled the suspension, brakes, engine, and driveline. The two-barrel 289 was completely rebuilt, incorporating hardened exhaust valve seats and new guides for use with today's unleaded fuels. Scott not only wanted the car to look good, he wanted it to be reliable enough to drive anywhere. Inside, much of the black vinyl standard interior is original because Scott's father took exceptional care of the car. It is a religious experience to hold a three-speed shifter knob in your hand knowing it was screwed on at Dearborn. Scott has been meticulous about what is replaced and what's best left alone. When Scott revs the engine and releases the clutch to engage the three-speed manual transmission, the sound of the four-blade steel fan drowns out the engine as the Mustang moves under its own power like it did nearly half a century ago at Dearborn. This takes us way back, especially when looking back from today's era of jellybean-shaped cars, electronic fuel injection, electric cooling fans, traction control, satellite radio, and six-way seats.